How to Prevent Tooth Decay in Babies? The initial baby teeth are very important. The form a foundation for the formation of permanent teeth and aid in speech development. If they fall off too early, the development of the permanent teeth will be affected. The gap left maybe filled by other teeth thus leaving little or no room for the permanent teeth to come in. In addition, if they are not cared for they may decay causing the child a lot of pain and discomfort. According to dentists, healthy dental habits should begin as soon as the first tooth develops so as to avoid decay. Contact with saliva of the mother or other caregiver: This passes the decay causing bacteria to the child. Long exposure of baby’s teeth to milk, juice or other foods and drinks with naturally added sugars. The bacteria converts these sugars into acid causing the teeth to decay. For babies below the age of one year, you can use a soft cloth to clean their gums and teeth. Once they develop more teeth, start using a soft tooth brush and toothpaste. For fluoride toothpastes, you should get a recommendation from the dentist. After 36 months, you can teach the child to brush the teeth on their own. Brushing should take at least two minutes and cover all the surfaces of the teeth. Since you may transfer bacteria to your child, ensure that you visit a dentist when you are pregnant for oral care. Bottle feeding will causing pooling, which increases the chances of tooth decay. In addition to tooth decay it can also cause choking. If you are using the sippy cup for soothing the child, fill it with water and not milk or juice. However, note that even if water is not harmful to your baby’s teeth, you should not give it in excess. When the child is a year old, you should introduce him or her to the regular cup. With a regular cup you decrease the risk of tooth decay. Also, they can’t use the regular cup when lying down and this decreases the risks of pooling and choking. Processed sugars are among the major causes of tooth decay. As such, you should limit the amount of sugar ingested by your child. You can give them more fruits and make healthy snacks that are not sugary and sticky. You should take your baby to the children dentist regularly. Tooth decay first appears as white spots at first and can only be identified by a dentist with the use of special equipment. By taking the child to an oral healthcare provider, the problems can be detected and prevented early before they become extensive. What to do When Your Young One Has a Toothache? 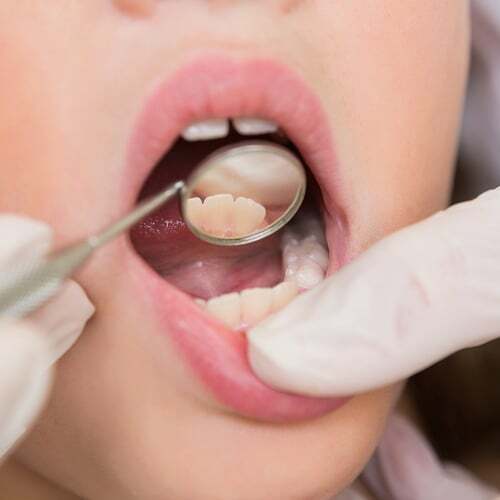 What to do if your child knocks out a tooth? How do I Care for My Little Ones Milk Teeth? How to Care for a Toddlers Teeth? Do Children Require Dental X rays? When is the Right Time to Bring My Child to a Dentist?